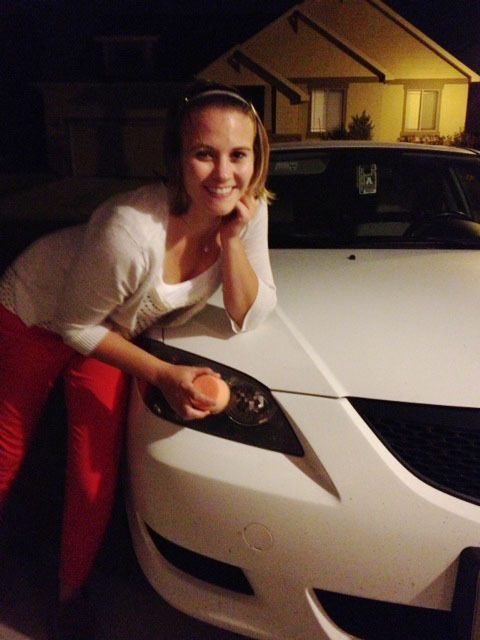 This is a Sponsored post written by me on behalf of Pep Boys for SocialSpark. All opinions are 100% mine. I got the opportunity to review a 3M Headlight Restoration Kit. I don’t know if you’ve ever noticed your headlights but after time they get really foggy. Not really sure why. But it makes your car look so much older and yuckier. So all you have to do is get this Headlight Restoration Kit, spend about 15 minutes (or about a half hour in my case) and the voila! 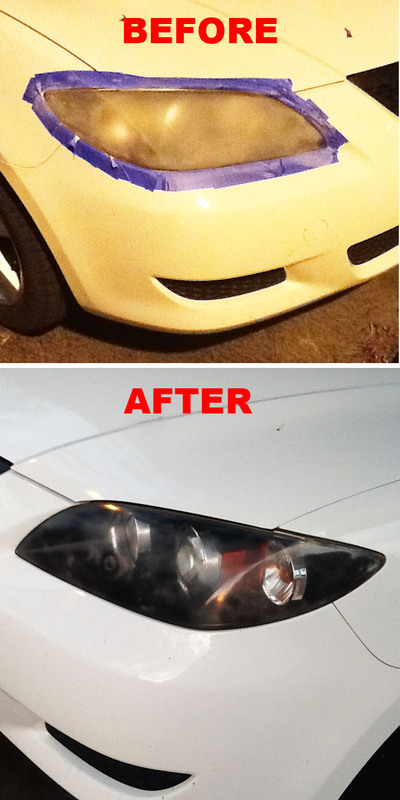 Your car instantly looks nearly brand new. Aww, here I am, buffing the headlight with the sander. And yes, I did do this at night. This kit was great! Super easy to use, no tools required! And it’s very affordable, where other kits that do this cost hundreds of dollars. You can find the 3M Headlight Restoration Kit at Pep Boys stores. And if you purchase it, be sure to use the Mail-in Rebate!! Seriously, doesn’t that look amazing?? So excited that my headlights look brand new again. So this kit was really easy to use, anyone can use it. The kit includes 1 orange foam pad with Hookit Attachment, 6 Gold Abrasive Discs, 4 White Abrasive Discs, 2 Green/Gray Abrasive Discs, 2 3M Rubbing compound, and instructions. All you have to supply is a microfiber detail cloth, masking tape, spray bottle and water, and paper towels. 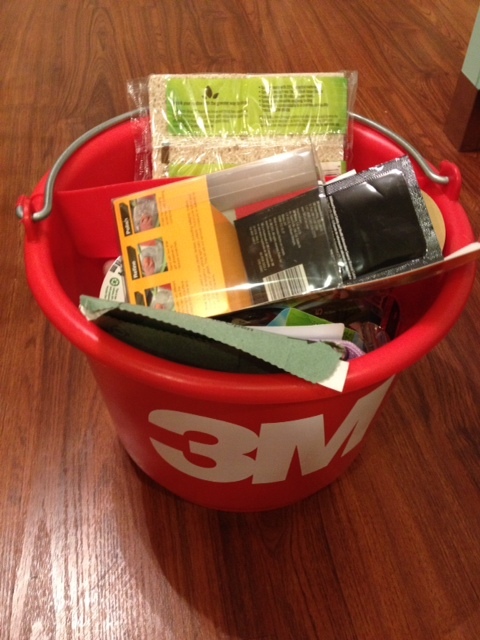 3M was generous enough to include the microfiber cloth and masking tape as part of this this fun bucket-o-stuff from 3M, chock full of goodies. There were all kinds of Scotch brand cleaning supplies and Scotch tape and whatnot. But it turns out that clearing up your headlines is not just a cosmetic thing, as I previously thought. It’s actually dangerous to drive with really foggy headlights, since it decreases your visibility at night. And it’s scary enough to drive during the crazy holiday season and blizzards and everything. What do you think? Why do you need the kit? And more importantly, do you want to win your own kit and goody bucket?? I would live to win this! Thanks for the review and opportunity! We need this for our older 4runner…the lights are definitely foggy! My old little putt-putt Honda Civic has foggy headlights. The car is 11 years old and is sort of falling apart on the inside, but only has 75k on it and I will drive it into the ground. I just glued the interior upholstery back to the doors the other day so I’m trying to do everything I can to make it look as good as the engine does. My car desperately needs this headlight restoration product. It is ten years old and is a great car except for a few dings and the foggy headlights. 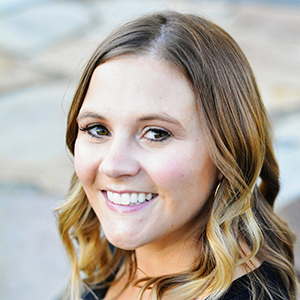 I am so impressed with what you did – I was completely unaware that there was such a prodcut. Hope I win so I can spruce up my foggy headlights ! I like Pep Boys on FB. I used a similar product and the results were amazing. Highly recommend it to anyone with foggy yellowed headlights. Was easier to see afterwards too. I would LOVE to win this kit for my DD’s BFF. she has tried to clear up her headlights on her own w/ NO sucess. Now she has a wee one in the back seat & I worry for her driving around @ nite w/ her foggy covers! The Hub & I were just talking about getting her a kit, (she is a college student w/ no job & a new Lil Man to care for) but this would be a HUGE blessing if I could WIN one!!!! Thanks so much to YOU & Pep Boys for this opportunity!!! Amazing! So after reading this I had to go out and look. 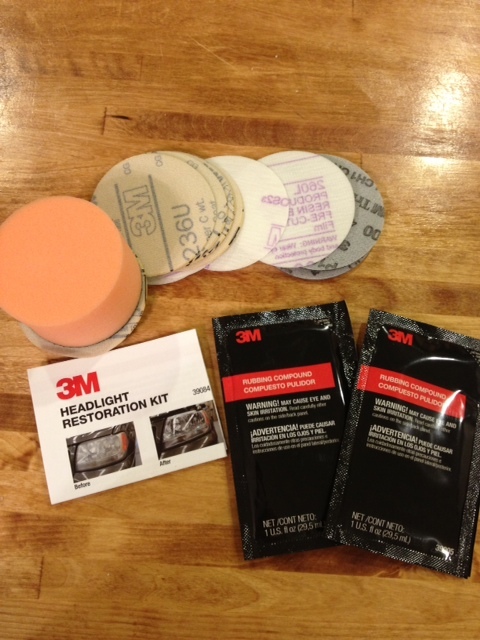 Your right and now I need this 3M headlight restoration kit. LOL My car is old, her name is Betsy and she needs to shine. Thanks for the opportunity and for telling me! Awesome! I’ve always wondered if this product really worked! My Maybelle – my 1998 Chevy Malibu really needs some ‘de-fogging.’ She’s a good ole reliable girl and I need to keep her cleaned up! I’ve also liked Pepboys on Facebook! This is amazing! I changed my headlights a little while ago and noticed how the covers looked “frosted” but didn’t realize there was anything I could do about it! This is amazing!! We live in the country so headlights are the only light on the road- my headlights could definitely use some work!!! What a useful giveaway! I would LOVE to win this kit! I have an 8 year old car and my headlights are in bad shape. I have tried several things to try and clear them up, but nothing has worked. Thank you for a great giveaway. Oh, I KNOW mine are over-due for this. Definitely. I didn’t even know you could do that with your car’s headlights. Now I am afraid to look at how bad mine are. I didn’t know they made kits to clear off the headlights. I can’t tell you how bad mine are. I didn’t realize they could be fixed. I really need this! My van could really use this kit, they need it very bad. I have been meaning to get a kit like this! I had never even thought about this before… thanks– cool g-way! My little VW Beetle needs this kit BADLY!!! That is a big transformation!! Since we live by the beach it seems like there is always a layer of muck on ours – this looks like it would help a lot! I’ve used this method time and time again, it works like a charm!